Where to start? With an inspection of course. If you haven’t had one within the last 12 months, get one scheduled and let them know this inspection has dual purpose: code compliance and renovation/upgrades options. Tell them what your initial renovation needs are and what you would like to do so they can be sure to give you everything you need. Be transparent about a turnaround time too – if you know you need to make renovations within the next three months, you don’t want to wait a month for your report. Once you have an inspection in hand, look at your report. If you have deficient items, what are they? Do you have a clear understanding of what needs to be fixed? Is it a code compliance issue that needs to be addressed? Ask all the questions and get all of your answers – especially if you plan on doing a renovation yourself. Is overall safety your number one goal? (Ahem, the answer is always yes). But seriously, if you’re looking at the overall project from a safety standpoint, you’ll want to be sure you are fully aware of code compliance when it comes to renovations and upgrades. Replacing wood planks with aluminum is easily done and cost effective. However, if you are changing seats, adding aisle-ways, rails, etc. you need to take into consideration that your modifications meet code compliance of a “new” structure. Other goals might include a larger seating capacity, ADA seating options and access, or a press box. Again, it all goes back to the structure. Let’s crash-course a little Code Compliance, shall we? 4101:1-10-01 [Effective 11/1/2017] Means of egress. 1029.1.1 Bleachers. 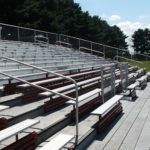 Bleachers, grandstands and folding and telescopic seating, that are not building elements, shall comply with Chapters 1-4 of ICC 300. But Ohio doesn’t enforce Chapter 5, so it gets a little muddy here doesn’t it? While it’s not enforced, it IS the example of the highest standard of compliance and safety. So while you “don’t have to,” you absolutely should follow the guidelines if not for any other reasons than safety and reduction of liability and risk – those should be reason enough to look into the requirements of Chapter 5. It all boils down to safety - ease of access for patrons and means of egress. Codes weren’t created to make our world full of crazy rules, they were created to keep our community and our children safe. We at FEC will always reference Chapter 5 when it comes to code compliance, renovations, and upgrades because our ultimate goal is to keep you safe. You have options with renovations. Don’t be afraid to think outside the box either. 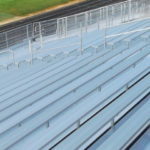 If you know another district is tearing down their bleachers, see if salvaging their aluminum planks is possible to help you reduce costs when replacing wood planks with aluminum. And always – if you choose to do a renovation yourself, call in an expert, before for advice, during with questions and afterward to have them inspect your work, they will likely see what you don’t know to look for. Code Compliance Questions? Renovation Questions? Need a Quote?